I’ve decided this year to start blogging my patterns. They will be available free in the untested version. If you would like the tested .pdf version with no ads, visit my etsy shop Drunken Aunt Wendy. I also have kits available to make Sheldon in his alternate light blue and purple color scheme. This is my Cuddly Aquarium series. Other in this series include Puck the Seal, Max the Mantis Shrimp, Lennie the Jellyfish, Silas the Snail, Cecilia the Narwhal, and Lucy the Lobster. All are available in my Etsy Shop. I have a few more to design and print and I will issue an ebook. Sheldon started out as a way for me to figure out how to make claws and then moved on from there. The pattern is below. As most crocheters say, please provide a link back to me so that I can get credit for this design. fasten off and sew up opening. Fasten off and join to side of body under top overlap four on each side. I love this pattern! Thanks for sharing it. What size hook did you use? I use an E hook for all my stuffed creatures. Just make sure yours is small enough that the stitches are tight so the stuffing peeks out. Thanks for the compliment. I’d love to see any finished item. cute crab, but the things you called antenna are actually the crabs eyes, and the spot where you added eyeballs is where their mouth parts belong. I have questions for you. The connectors between claws and body? What is that? How many stitches is in row 2 of the white of the eyes? 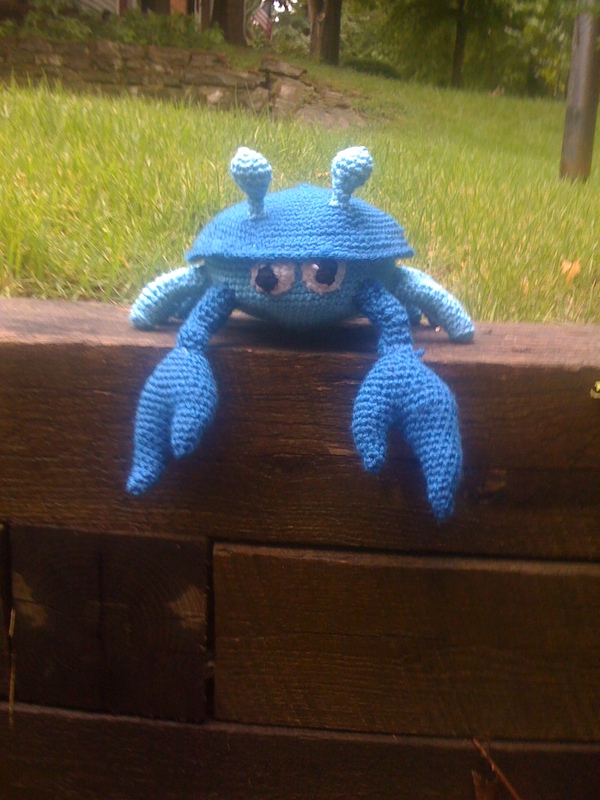 I have a customer looking for a crab for a barbecue she is having and would like me to make one for her. Your pattern and design seems easy enough to make, and it is very cute. The connectors are like the legs that attach the claws to the body. There are 12 stitches in the second row of eyes. You do a normal increase and then do two hdc in the same stitch, then a normal increase and repeat. Hope that helps. Please send any completed photos. I’m trying to set up a photo gallery of completed projects. If you have any other questions, pleae let me know. on step 3 for the legs, i was wondering whats BLO? Work in the Back Loops Only. That will make it fold and make the foot flat. What is the size of the finished crab? The shell is approximately 8-9 inches depending in your hook size. I AM NEW TO USING A COMPUTER. I DON’T SEE A PINTEREST SIGN OR SOMETHING THAT I CAN DOWNLOAD THE PATTERN. HOW CAN I GET THE PICTURE AND THE PATTERN SHORT OF HAND COPING THE PATTERN? THANK YOU FOR YOUR HELP. You can add it to Pinterest if you have Pinterest set up on your computer. Otherwise if you want to print the pattern, hit control p. Good luck. After making small claw I don’t understand what to do next. The small claw is crocheted to the large claw. You crochet around the large claw and then the small one. You then just continue in the round. There will be a tiny hole that you will need to sew up later. That helped, another question on the legs is it just step 3 you do the BLO? Yes. This makes the ends of the legs flatter so it sits better.